The Group is based in West Sussex and owns a number of Care Homes in Sussex, Dorset, Northamptonshire and Worcestershire. 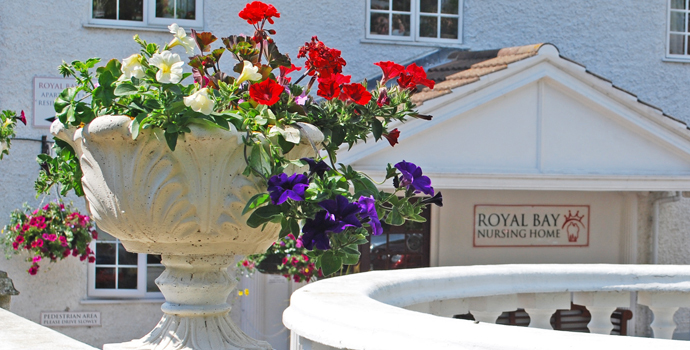 Royal Bay is an expanding group committed to the highest standards of care. It has been operating as a group for some 10 years, and its management team has experience in the care sector since 1976. Russell Wilson is a Master of Business Administration graduate. He has many years experience of operating in the private care sector. He is currently a member of various committees associated with health care. He is the former Chairman of the Dorset branch of the Registered Nursing Homes Association (RNHA). Anthony Wilson also has many years experience of operating in the private care sector. Qualified in Accounting, as well as being a Registered Nurse, Anthony has the skill set and knowledge that controls and oversees the group's finances, as well as contributing his experience as a qualified health professional. Jules Dove has worked in the care industry for over 20 years. Jules also trained as a Nurse, before quickly going into home management. She continued to develop herself and her skillset into all areas of nursing, training, assessing as well as business management. Becoming our Group Development Manager in 2012, Jules oversaw all clinical and operational aspects of all homes, supporting all of our Managers in their day to day roles. Now Clinical Director, she still continues with the group's clinical development, implementing necessary policies and procedures but has increasingly additional Director duties. Tim Wilson is the newest to the care profession, joining Royal Bay in March 2011. Tim graduated from Univeristy of Southampton in 2009 in Management (BSc), focusing particularly on Marketing and Digital Media. As well as overseeing and maintaining the group's marketing, advertising and communications, Tim also assists and supports the Clinical Director in her role of supporting the Managers and any requirements they may have. Becoming Communications Director in 2016, his duties have continued to expand including the maintenance of internal IT systems, all recruitment as well as usual Directorship responsibilities. Jamie Wilson is a Neurosurgery Spine Specialist, who graduated from Oxford University in 2008, completed his research foundation years at Southampton General Hospital before going on to specialise at Leeds General Hospital for the past 7 years. From his various research projects, he has been published several times in the BMJ, now he is currently working in Canada at the Toronto General Hospital.